With the big Bottled Fuchsia 24 Hour Extra Life Gaming Marathon coming up this weekend, you may be wondering how things could get any more exciting. We have one word for you: stickers. 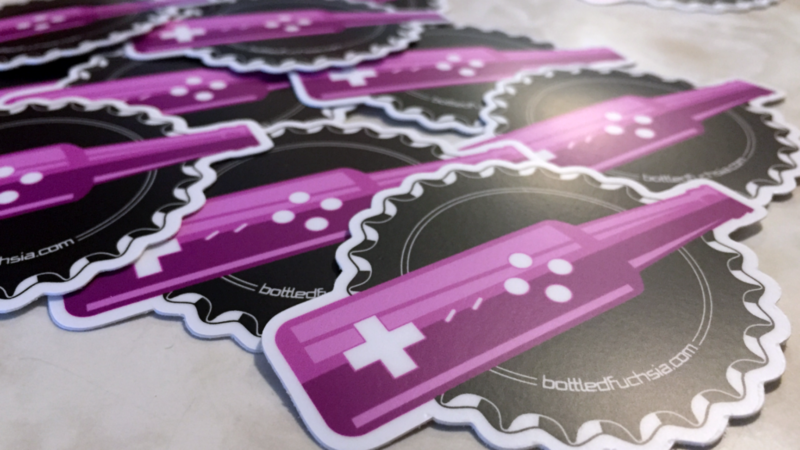 Hot off the presses from Sticker Mule, the Bottled Fuchsia logo has been immortalized as a 3″ piece of die cut vinyl that’s ready to be slapped onto a surface of your choosing. We’ll be giving a sticker to the top three donors during our Extra Life stream this weekend, so tune in starting at 8AM and make a donation to the Children’s Hospital of Philadelphia for your chance to get one! Don’t forget that this year’s marathon will begin with Jon vs. Aaron 2: Mega Man 3 Robot Masters Rush. Afterward, the Bottled Fuchsia crew will spend the day playing some of our couch co-op/competitive favorites, and also look at a few candidates for our upcoming Game of the Year podcast. Keep an eye on our Facebook and Twitter pages for updates on what’s coming up as we try to make it to Sunday morning.